This is a great product that came out recently. 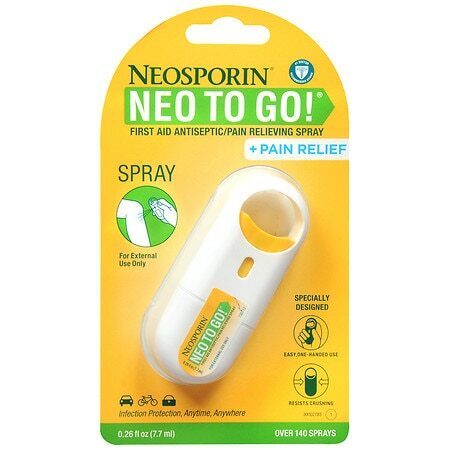 I'm sure you know about Neosporin and how good it is for infection protection. Well now it comes in this handy easy spray container. This fits perfectly in your purse, backpack, or even on your key chain. Well I'm not sure if it's supposed to be for this but my husband and I got a lot of bug bites over the weekend. And we were spraying it on those. And it really seemed to help! You can find Neo To Go in most major retail stores, such as Walgreen & Walmart and more! Disclosure: I received this product complimentary from Influenster for testing purposes only. All opinions are my own. I keep this in my backpack because my two are always getting scrapes and cuts.